Similar to a bone scan, the ProstaScint scan uses an injection of low-level radioactive material to find cancer that has spread beyond the prostate gland into other areas of the body. The ProstaScint scan utilizes radioactively tagged antibodies (Indium-111 labeled capromab pendetide) that is designed to travel throughout the body and attach themselves to prostate cancer cells. The advantage of this test is that it has the potential it has in detecting the spread of prostate cancer and how it can distinguish prostate cancer from other forms of cancers and benign disorders. The Prostascint scan is a two step test spanning a total of 4 days (96 hrs). The day prior to having the test done you will be asked to begin a clear liquid diet, followed by an oral laxative later in the evening. This is done in order to give the Nuclear Medicine physician a clearer picture to examine. The presence of urine or stool will make it difficult to examine areas on which special attention is given. On the first day of the scan the specialist will will administer the injection of ProstaScint and monitor your condition both during and following the injection. If there are no complications following the injection you may return home. Four days following the ProstaScint injection, you will be asked to return to the hospital for the imaging portion of the test. As with the injection, you may be required to take a laxative or use an enema to cleanse your bowel and make the test results easier to interpret. You will be positioned under a special camera called a gamma camera and will receive a second intravenous injection in your arm before starting. Once you are in position with your IV in place the specialist will take a number of different images. The scanning or imaging process usually takes about two hours to complete. Depending on the results of the initial images taken second imaging session may be required but that typically only account for about 25% of patients. It’s very unlikely that you will experience any of the side effects listed above. Following a ProstaScint infusion you will be able to resume your normal daily activities and will have no effect on your sexual function. Most doctors in general will not recommend this test for men who have been recently diagnosed with prostate cancer. 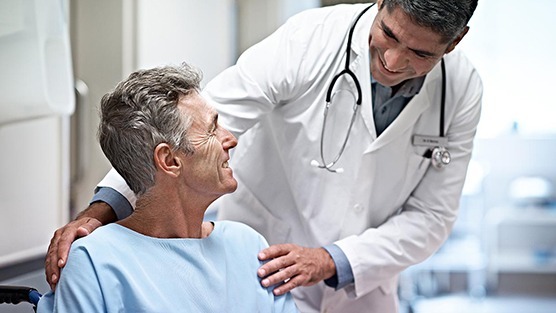 However ProstaScint may be useful following prostate cancer treatment if your PSA level becomes elevated and other diagnostic tests are unable find the exact location of your cancer.